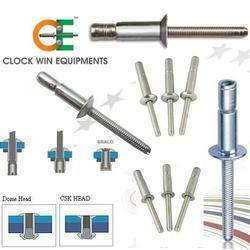 Prominent & Leading Manufacturer from Ahmedabad, we offer aluminum blind rivets, steel blind rivets, counter sunk blind rivets, flower blind rivets, large head blind rivets and aircraft blind rivets. We are one of the leading manufacturer, supplier, exporter, wholesaler and retailer of Aluminum Blind Rivets in the market. The produced item is developed by machines of advanced technologies and is manufactured under the supervision of skilled labors. The company provides a product with simple installation and avoids all surface marring. The item is very light weighted and is easily portable. Blind Rivets are available at very reasonable and affordable price. 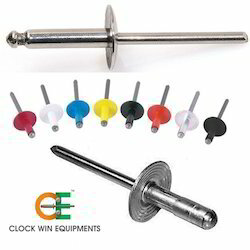 Steel Blind Rivets consists of two parts the blind rivet body and, within it, the setting mandrel, The blind rivet body is inserted in a hole in the materials to be joined. 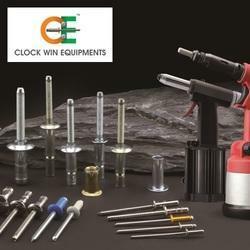 The tool is actuated and the jaws of the power operated or manual riveting tool grips the mandrel of the rivet. The blind rivet is set by pulling the mandrel head into the rivet body, expanding it, and forming a strong, tight, reliable joint. At a predetermined setting force, the mandrel breaks and falls away. Our company is a proud manufacturer, supplier, exporter, wholesaler and retailer of Counter Sunk Blind Rivets. The offered product is one of the best-selling products in the market and is highly valued by our loyal customers. 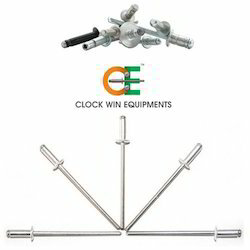 It is available in specific designs given by our professional designing engineers. The inclined angle of seventy-eight and hundred degrees are accessible and as hundred-degree angle rivet is extremely common, we maintain great stock for instant delivery. We are presumed makers and suppliers of the complex scope of Flower Blind Rivets that includes a touch of style and polish to the pieces of clothing and other design extras. These Flower Rivets are accessible in diverse sizes and designs and are intended to maintain unpleasant and intense conditions. 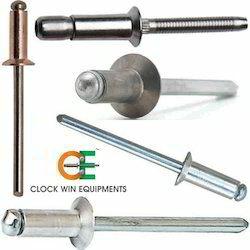 We additionally offer customization of blossom bolts for size and emblazoning examples to suit customer necessities. We produce and supply finish scope of Large Head Blind Rivets made of finest quality metal with impeccable accuracy and tough development. Our scope of Large Head Rivets have double the under-head bearing surfaces in the examination to the vault head bolts and are extraordinarily intended for applications where delicate or weak materials must be amassed with an unbending support material. 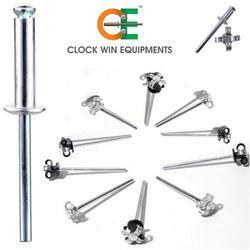 With the assistance of our skilled professionals, we are offering a quality tested array of Stainless Steel Blind Rivets to our valuable clients. 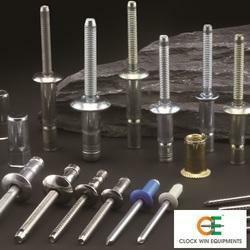 Our offered Steel Blind Rivets is available in the varied specification as per the different demands of the clients. They give the trouble-free performance to the user as they are stringently tested on different quality parameters. We give complete finishing to our products before the final dispatch and satisfy a maximum number of customers. 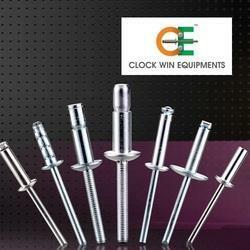 For the complete customer satisfaction, we are providing them a desirable assortment of Mild Steel Blind Rivets. The offered range of products is manufactured by competent persons by consuming optimum grade components including updated technology. Apart from this, our entire product range including Mild Steel Blind Rivets offered by us is examined on diverse parameters and provided with customized packaging. Our organization is highly rated in the field of providing GI Blind Rivets to our clients. Our Wood G I Blind Rivets is known for its unique features such as long-term sustaining, superior in designing and high in quality. They are manufactured, processed and tested by the team of highly knowledgeable and experienced professional at advanced units. Our entire products ranges are acknowledged for its excellent performance and high durability. 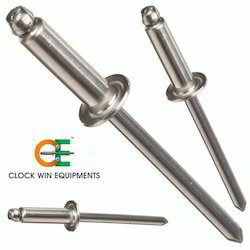 Our range of Galvanized Blind Rivets is revolutionary. The mandrel design offers superior performance when operating in under grip or over grip conditions. We offer steel blind rivets, which are of high strength with load bearing capabilities, providing strong, vibration resistant joints. These are used in steel fabrication, structural sub-assemblies, framework, hinge fixing to steel frames, steel furniture and many others. These steel rivets have high resistance to corrosion. 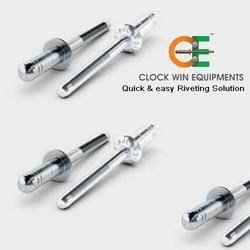 We are one of the leading manufacturer, supplier, exporter, wholesaler and retailer of Blind Rivets in the market. The produced item is developed by machines of advanced technologies and is manufactured under the supervision of skilled labors. The company provides a product with simple installation and avoids all surface marring. The item is very light weighted and is easily portable. 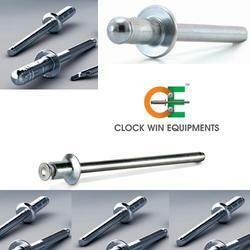 Blind Rivets are available at very reasonable and affordable price. Structural Blind Rivet high-strength fastener, designed to be used in single-sided structural applications with heavy loads. Structural blind rivet is synonymous with security and performance.